After a weeklong Florida vacation full of sun, sand, and tropical cocktails—Piña Coladas, Beergaritas, Mojitos, and Caipirinhas galore!—it finally feels like summer. I’m nothing if not a sucker for the spirits of the season. In summer’s case, this usually means opening my mind and liver to two liquors I don’t usually drink: rum and tequila. (Chances are you know at least five people who’ve had “a really bad night” with tequila and generally stay away from the stuff. My really bad night involved too many Tequila Sunrises mixed with a smidge too much freshman-in-college idiocy.) Tequila agrees with me well enough now, especially if I mix it with margarita mix and a Corona to make the all-powerful Beergarita. I could go on about Beergaritas for days, but I’ll save that for another time. The original recipe for the El Grito calls for a smokier reposado tequila, but I enjoyed the blanco tequila from Espólon so much on vacation that I decided to swap the brown tequila for white. I should note that Marc found this recipe in Spirit—the in-flight magazine for Southwest Airlines. I’d always thought that airline reading was limited to learning about dog stairs in SkyMall and perusing those terrifying “In Case of Water Landing” safety cards. Who knew! Mix the Sriracha and water and pour into ice cubes trays. Freeze overnight. Shake the tequila, Cointreau, and lime juice in a cocktail shaker with a few ice cubes. 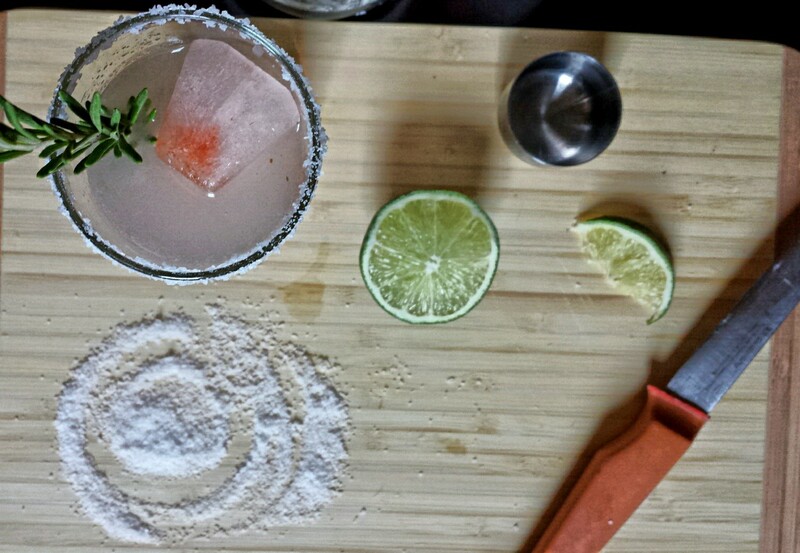 Moisten the rim of a tall, skinny glass with a lime wedge, then twist in kosher salt to coat. (I used a Collins glass at first, but it was too big.) Pour the drink over three to four Sriracha ice cubes. Garnish with a fresh rosemary sprig. 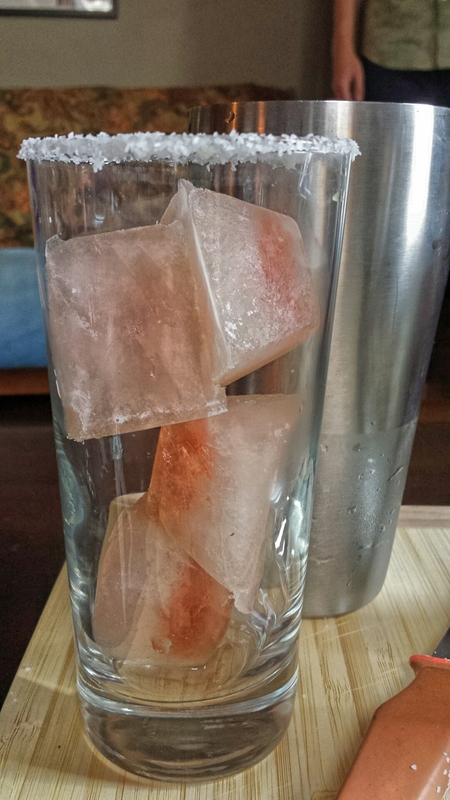 The ice cubes melt as you drink, infusing the cocktail with that spicy, smoky Sriracha flavor as you sip. And it’s definitely a sipper. Enjoy!